Dooyoung Hah was born in Seoul, South Korea. 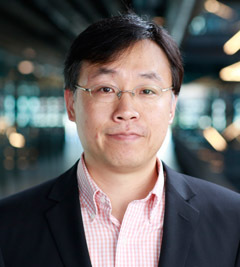 He received the B.S., M.S., and Ph.D. degrees in Electrical Engineering from the KAIST, Korea in 1994, 1996, and 2000, respectively. His Ph.D. dissertation topic was a low-voltage RF MEMS switch. He is currently an Assistant Professor of Electrical and Electronics Engineering at the Abdullah Gul University, Turkey. Before joining Abdullah Gul University, he has worked at the Louisiana State University (LSU) as an Assistant Professor, at the University of California, Los Angeles (UCLA) as a Staff Research Associate, and at the Electronics and Telecommunications Research Institute (ETRI) as a Senior Member of Research Staff. His research interests include M/NEMS, optical MEMS, biomedical imaging devices, nanophotonics, surface enhanced Raman spectroscopy (SERS), energy harvesting devices, sensors, RF MEMS, and nanotechnology. He has authored and co-authored over sixty five publications in journals and conference proceedings. He holds eight US/Korean patents. He was the third place winner at the student paper competition at 2000 IEEE MTT-s.